We’re pleased to bring you news of a Teachmeet event coming to Limerick early in 2018! TeachMeet Limerick, taking place on Monday 5th February, is for principals, teachers, SNAs, student teachers or anyone interested in education. The objective is to inform and inspire attendees to try out some new and innovative ideas in their classrooms after the event. The organisers are currently seeking presenters! Your input is invaluable. We encourage you to share your thoughts, ideas and experiences in a short presentation. Choose your topic: Perhaps you might like to share a teaching resource that you love, a great website or app that you have tried out, a classroom activity or strategy that has worked effectively for you. The list is endless! Choose your format: Oral presentation/ multimedia/demonstration or any other format. The deadline to submit your interest in presenting is Friday 19th January 2018. Once all applications have been processed, you will receive an email confirming your inclusion in the schedule and where to upload your presentation (if applicable). We hope to facilitate all interested presenters however if there is an oversubscription, a lottery system will determine the number of presentations. The event is free but registration is essential. Please book your place on Eventbrite. Spread the word to your friends and colleagues! Contact Grace at gburke@scoilide.ie for further details. We’re always happy to see other Teachmeet events taking place around the country and are delighted to share news of one coming up in County Clare next month! 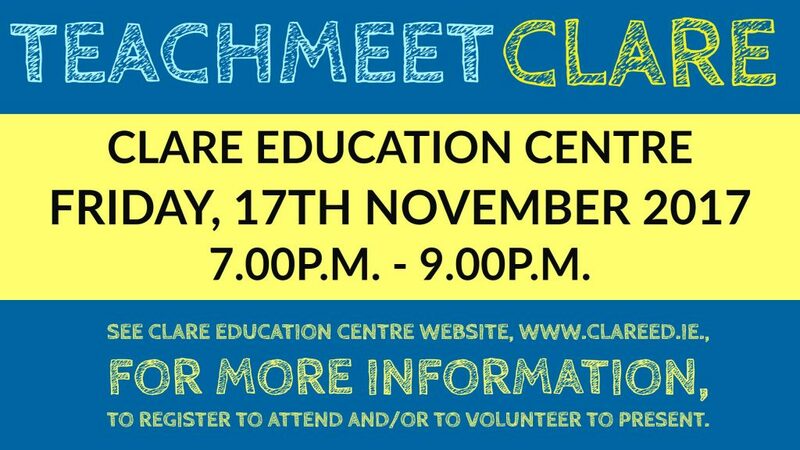 Teachmeet Clare will be held in the Clare Education Centre, Ennis, Co Clare, from 7pm to 9pm with refreshments served before the event. TeachMeet Clare is for principals, teachers, SNAs, student-teachers and all who are interested in education. The objective is that TeachMeet Clare will inspire attendees to try something new in their classroom and/or school in the days and weeks following the event. The event is free but registration is essential. 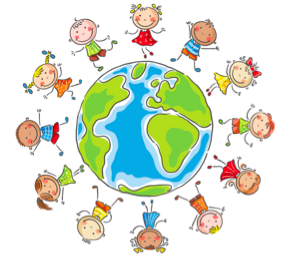 Please book your place on the Clare Education Centre’s website which can be accessed via the following link: https://www.clareed.ie/cpd-courses/primary-courses/579-teachmeet-clare.html. Choose your topic: Perhaps you might like to share a teaching resource you love, a great website or app your class have explored, a classroom activity or strategy that has worked effectively for you, or a creative cross-curricular STEM project that captured your pupils’ imaginations. The list is endless! Choose your type of presentation: nano (2 minutes) or micro (7 minutes). Choose your format: Oral presentation/ multimedia/ demonstration or any other format. The deadline to submit your interest in presenting is Friday, November 10th. Once all submissions have been processed, you will receive an email confirming your inclusion in the schedule and explaining where to upload your presentation (if applicable). We hope to facilitate all interested presenters. If oversubscribed, a lottery system will determine the number of presentations. Follow the Twitter hashtags #TeachMeetClare and #TMClare for updates, and contact Leanne at teachmeetclare@gmail.com for further queries. They’ve also produced a flyer you can download and share if you’d like to spread the word! We’re delighted to let you all know that after the success of the last two years’ events, Teachmeet Ireland will once again be hosting an event at this year’s FÉILTE event organised by the Teaching Council at the RDS in Dublin. Every year FÉILTE, the Festival of Education in Learning and Teaching Excellence, is a celebration of teaching which showcases the work of teachers who are leading innovative learning projects. This year’s theme is simple: ‘Leading Learning for All’. Our Teachmeet offers an opportunity for inspirational educators to meet and share good practice, practical ideas and personal insights into education. So can you share some tantalising tips, sizzling strategies or innovative ideas with us? Or are you looking to be enthused, excited and energised by similar minded educators? If so, come join us on October 7th! PLEASE NOTE: While tickets to attend FÉILTE are usually awarded by lottery – which you can enter at the Teaching Council website – anyone chosen to present at the Teachmeet event will be guaranteed a ticket for the entire FÉILTE event. Following your application, we will be in touch by mid-September to confirm whether or not you have been chosen to present. We’d also appreciated if our followers could help us spread the word about the event – tweet using the hashtag #TMfeilte, and print off this flyer to share with colleagues in your staffrooms! We always like to see Teachmeet events flourishing around the country – and we’re delighted to see that County Kerry will shortly be hosting its second Teachmeet and Makermeet! Last year we shared details of an event in Killarney – and now its organisers are running a similar event in Tralee! Teachmeet and Makermeet Kerry will be held at the Education Centre in Dromtacker, Tralee – with a two-hour Teachmeet kicking off at 10am, and Makermeet beginning at 1pm. Makermeets are areas in which teachers learn crafts such music creation, coding, interactive skills and more. If you’re interested in attending, you can register for the Teachmeet at teachmeet-kerry-april17.eventbrite.ie, and for the Makermeet at makermeet-kerry-april17.eventbrite.ie. If you are interested in presenting at either of these events, please register your interest at: bit.ly/teachmeet-kerry. Both events are free to attend and all are welcome! If you can’t make it, but would like to follow along online, you can follow on Twitter @teachmeetsouth or @chrisreina and use the hashtags: #tmkerry and #teachmeetsouth. If you would like further information, you can go to irishteachmeet.wikispaces.com, or contact Chris Reina on 087 2685020 or at chris@teachtech.support. After the success of our Principalmeet event at the IPPN Conference earlier this year, we’re delighted to be asked to host a similar event for Deputy Principals! Our first ever ‘DPmeet’ will be held at the IPPN Deputy Principals Conference on Thursday 23rd March 2017. The theme of the ‘DPmeet’ will match that of the conference as a whole – The Power of One. It’s an opportunity for inspirational educators to meet and share good practice, practical ideas and personal insights into primary education and leadership. All our presenters will come from the Conference delegates so if you would like to present, please see our Presenters page for more information. Teachmeet Ireland’s first event of 2017 will be at the IPPN National Conference later this month. We’ve renewed our partnership with the IPPN to organise the Principalmeet at the event, to take place on Thursday 26th January. The theme of this year’s Principalmeet will match that of the conference as a whole – The Power of One. Our own next Teachmeet events are coming up on Saturday 19th November in Tullamore – but if you can’t make it that far, you might be interested in another Teachmeet event happening on the same day in County Kerry! 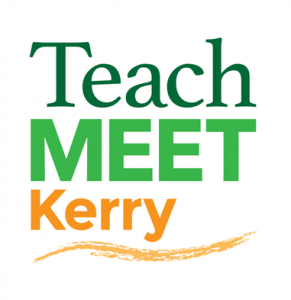 Teachmeet and Makermeet Kerry will be held in the Gleneagle Hotel, Killarney – with a two-hour Teachmeet at 11am, and a two-hour Makermeet at 2pm, with an hour’s break for lunch at 1pm. If you’re interested in attending, you can register for the Teachmeet at teachmeet-kerry.eventbrite.ie, and for the Makermeet at makermeet-kerry.eventbrite.ie. If you are interested in presenting at either of these events, please register your interest at: bit.ly/teachmeet-kerry. We’re delighted to let you all know that after the success of the 2015 event, Teachmeet Ireland will once again be hosting an event at this year’s FÉILTE event organised by the Teaching Council at the RDS in Dublin. Every year FÉILTE, the Festival of Education in Learning and Teaching Excellence, is a celebration of teaching which showcases the work of teachers who are leading innovative learning projects. So can you share some tantalising tips, sizzling strategies or innovative ideas with us? Or are you looking to be enthused, excited and energised by similar minded educators? If so, come join us on October 1st! We’re delighted to announce our next Teachmeet will will be held in Bray on Thursday 21st April, 2016. This theme will explore some of the excellent work currently taking place in primary schools around mental health and wellbeing. It will also be an opportunity to examine the inspiring resources available to us which go beyond the simple day-to-day lessons. So can you share some tantalising tips, sizzling strategies or innovative ideas with us? Or are you looking to be enthused, excited & energised by similar minded educators? If so, come join us on April 21 at 7:30pm! We may even have a mince pie for you! Free tickets can now be reserved at our Eventbrite page. UPDATE: If you’d like to present at the event, have a gander at our Presenters page for more information. Our list of presenters is now confirmed – click here to see who’ll be presenting! We’d also appreciated if our followers could help us spread the word about the event – tweet using the hashtag #TMireland, and print off this flyer to share with colleagues in your staffrooms! 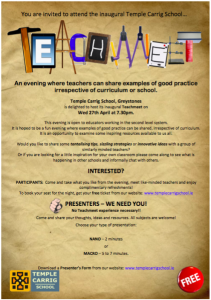 We’re always delighted to hear of schools getting involved in organising Teachmeets and wanted to let you know that Temple Carrig School in Greystones, Co Wicklow will be hosting its first event in just under two weeks’ time, on April 27. Open to teachers working at second-level education, it’s hoped to be a fun evening where examples of good practice can be shared, irrespective of curriculum. Click here to see their flyer for more details!